Couture Mayah is the world of Maija's dressmaking projects, a hobby site created for the amusement of friends and the seamstress herself. Here you can find photographs and information of garments made by Maija, which includes both every day wear and historically inspired costumes. This is the English version of the site. It has all the pictures that the original Finnish version has, but occasionally a little less comments and information due to language difficulties. My English is far from perfect, but at least it offers easier navigation for non-Finnish-speakers. Some accessories for the 1870's ballgown: Another shoe upcycling project and a last-minute mantelet. I'm slowly getting forward with Natural Form era, and currently working on a day dress. The late 1870's evening gown that I have always wanted to wear. Happy New Year everyone! There is still some last year stuff left, like the accessories I made for the Robe a la Francaise. Let's take a closer look on the shoes. Finally, the Robe a la Francaise. The annual L'Amusette ball's theme this year was the French Revolution. As I don't have much late century stuff on my garb, I made a new jacket that has been on my list for a long time. A surcote-like thingy I made for Jarno a few years back finally got photographed. The robe a'la francaise project that I had almost forgotten has received some attention again lately. I'm super happy to report that the robe is almost finished, though the petticoat and stomacher are yet to materialize. For the last year much of my time has went to making bobbin lace for the sleeve ruffles, and I have plans for matching shoes as well. Couture Mayah celebrates in style with blue velvet and sparkling wine. Some time ago (okay, last year) I made a houppelande. It turned out somewhat Disney-esque. It also needed a fancy new belt. A bit finer new kirtle, that did not turn out exactly as I intended but is nevertheless nice. The Great Turk and his favorite concubine from L'Amusette's Bal Orientale. Important warning: Historically inaccurate content. May contain acrylic. Couture Mayah wishes everyone a Happy Finnish Indepence Day, and totally unrelated to that returns to the days of Swedish rule with a new 14th century dress. 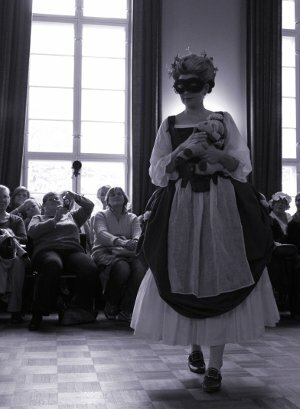 For L'Amusette's annual April ball I made a new dress in the style of 18th century masquerade costumes. It will get worn next at the Feast of All Saint's ball in Viapori at the end of the month. For the past summer I made a 1950's inspired dress for myself and an informal 18th century outfit for Kaisa. For the last December's Sveaborg Christmas Fair I made a Brunswick inspired by the portrait of Lady Mary Fox. For the Christmas Ball at the evening it turned into a Pet en l'air dress. Happy New Year! I know it's already February, but better late than never, that's our motto here at Couture Mayah. ...Which brings us to how I finally made a garment I have planned to make for about four years: The pleated men's gown from Thursfield's "The medieval tailor's assistant". So happy the get that fabric from stash to use! Last summer Jarno also got a somewhat less exciting new basic tunic (scroll to bottom of the page for it) and a tablet woven drum sling, added at the end of the medieval accessories. This year I did make a new dress for the Sveaborg Christmas ball, but haven't found time for a proper photoshoot yet... But for now, here are the new shoes I wore with it instead. While Absinthe is really more of a late 19th / early 20th century drink, I'd like to think an 18th century Absinthe Fairy would have looked like Kaisa in her new roundgown. Jarno's new 18th century suit is finished at last! Read the whole saga and see the pictures here. A medieval dress I made last summer got a chilly wintery photo shoot some time ago. Also another silly piece of headwear. For my modern wardrobe I recently made a cute 40's inspired dress. Kaisa stopped by again, and happily we had time for a photoshoot. "Emma Hamilton gets lost in Ann Radcliffe's world", aka "The New Stays". Something for the modern world for change: Last year I was inspired to make a new dress for a friend's wedding. My last years number one project, Jarno's new suit, is still on the progress but seems like it will actually get finished. My sister Kaisa's 1780's wardrobe now has a pair of pockets, a bumroll, an almost finished shift and an almost bound pair of stays. And a promising pattern for a roundgown. My friend Ida recently spent one Sunday afternoon at photoshoot. We photographed an 18th century jacket I made her a few years ago and stays I made earlier this year. I finished Jarno's waistcoat this week. I've also began to plan 1780's outfit for my sister Kaisa, though currently I'm only working with the stays pattern. A few years old cloak finally got photographed, it can be seen on the next page from my winter cloak. Minor accessory thing: a painted mask. I placed it on 18th century accessories even though it doesn't really have anything 18th century about it, save that I made it for an 18th century ball. What else is up? Well, Jarno's new suit is making slow but steady progress. The breeches are almost finished and the waistcoat about halfway. Baroness von Mannheim was recently strolling about garden in her shift and new stays. Yes, we have pictorical evidence of the incident. We blame the intoxicating scent of apple blossoms. The Baron's new suit is now cut, which was my main holiday plan. Now I can just go sightseeing and re-enacting for the rest of the time! Okay, I may yet fix my old floral anglaise / polonaise to fit over my new stays for Stockholm. I have now finished the patterns for Jarno's new 18th century suit and plan cut it soon. After next week I also have my summer holiday, and we shall head for Stockholm once again. This time we shall also attend a ball in Kristinehov Malmgård organized by Gustaf Skål. One of the last years main projects, the new Robe á la Polonaise. Finally. Couture Mayah celebrates Valentine's Day with an underwear edition with lots of pastel toned cuteness! The new stays are finally here with matching boudoir mules. 18th century underwear page also got some new additions and bit of a facelift. At the moment I'm close to finishing two projects: A 50's inspired dress for a friend's wedding next Saturday and another pair of stays. My next main project will be a new 18th century suit for Jarno. Couture Mayah wishes ye all Merry Christmas! This Yuletide post shall reveal (finally) Erhart of Mannheims garderobe, which has gradually gained new items during the last two years, all of which are now finally photographed. Couture Mayah proudly presents: Doublet and joined hose, tabard, a houppelande gown (see for the pictures very suitable for the season), two linen tunics and shirts & accessories and other small stuff. Margarethe has also gotten a new linen kirtle and a hood. Currently I'm working on a new (another!) pair of 18th century stays and a friend's bridal gown. Baron von Mannheim's scant 18th century wardrobe got some sorely needed additions: Another shirt and a finer silk waistcoat. His new suit is at the moment still a bolt of fabric in the corner of my sewing room. My home town Tampere got it's first big 18th century event 29.9.2012. The event's official website (which is unfortunately only in Finnish) has a picture gallery of the day. I'd like to thank all the re-enactors who took part and I hope to see you all next year too! One of the highlights of the day was a fashion show organized by Riikka Santonen. It traced the 18th century clothing trends from late baroque to empire fashions, including examples from all strata of society and also military uniforms. Several pieces from Couture Mayah were also included. Pictures of the fashion can be seen on Teemu Laukkarinen's site. Many thanks for taking and sharing them! A sneak peak to 18th century fashion was already offered to good people of Tampere during the week, as we were happy to get the chance to turn one of the windows of a department store Kekäle into a display of roroco loveliness. My contribution was the riding habit, quilted petticoat and print jacket and of course some accessiories, including my new boudoir shoes, which unfortunately haven't gotten a project review yet. Pictures of the window display can be seen here. Many thanks to Kekäle! The day ended in a wonderful ball organized by my friend Ida. I got my new dress finished in time for it, but more on that later. I have only one new project to present this time, and it's a small one, but here it goes anyway: A new petticoat for my pet en l'air. As usual, there will be more to follow... some day. Couture Mayah is resurrected at new domain after the recent downtime! For the last year's Christmas market I was inspired to throw together a printed cotton jacket I had planned to make for a long time. I also turned a quilted bedcover into a petticoat to wear with it. More practical, basic stuff followed: A pair of quilted jumps (this time quilted by yours truly, though by machine) and another ultra simple but cute jacket. These, like the aforementioned outfit were shot at an idyllic heritage farm called Kovero. My categorizing mania has gotten even worse: Couture Mayah now has a site of its own for both hats and caps. The first has one newcomer, another straw hat inspired by the movie "The Duchess", and the latter two new caps, one for each of my new outfits. Currently I'm working on a striped polonaise, which I'm planning to wear at the first proper ball in Tampere at the end of September. 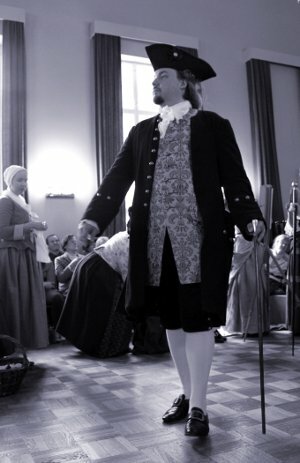 At last I can present the long awaited 18th century riding habit, finished in September 2010! My 18th century wardrobe has grown on the field of headwear enough to lauch a project page dedicated to 18th century headwear. Hopefully more will follow! Last year's May I re-styled an experimental pair of shoes into 18th century fabric covered shoes. Again, I hope my collection of period shoes will also grow in the future. Currently I am working on my third pair of 18th century stays. So far they look quite promising, and I hope at last get the fit 100% right. And yes, of course they are light blue! This fall was spent in such a hurry that even though I made some new stuff I never had time to document any of it. Here are a few things that I've finally gotten photographed, some more will follow later. My cousin Johanna and her spouse Micke celebrated their wedding on June. Here's pictures and story of her dress. During the last year we also got into SCA. My first medieval garments are a 14th century kirtle, sideless surcote and a fancy velvet caul. Jarno also got a 15th century outfit, which will appear on this site later. My plans for this year include more late medieval stuff, a new pair of 18th century stays and turning the lovely striped fabric I found last winter in Stockholm into a polonaise. I must sadly announce that due to a busy schedule and laziness I have made the decision the present my latest projects without full translation. Few people read the full commentary anyway, but may find the pictures interesting. I may be inspired to add a full translation later, but at the moment I don't want to keep the site flagging behind waiting for the English versions. It's been some time since I worked for a customer (Jarno doesn't count), but now I made a corset for my mother. There was a campaign costume competion at work again this spring, here you can see my entry. I wanted something new for a ball on May, and decided to make a very classic Chemise a'la Reine. I have also made some other small stuff, and will try to get more updates when I have more time. The medieval garb I promised is on the way too! On the summer I was inspired to make new 18th century stays. More about them, and my costume for Le Grand Bal Masque - Ehrensvärd 300v here. The abovementioned stays were also a part of two other masquerade costumes: One for a wedding with a pirate theme and the other for Halloween. I wore my Pet en l'air (which I'm liking more and more) to the Christmas Ball. For this occasion I made some new accessories, a pair of mitts, a muff and a lace ruffle for my neck. All of those can be found in 18th century accessories. What else? Lot's of plans for the new year of course! Let's see which of those actually come alive. Recently we have been tempted by the medieval scene, and are planning to evoke Baron von Mannheim's ancestor and his Lady with suitable 15th century garb. I still have a lot of 18th century things in my mind too, and possibly also some modern garments. The Pet en l'air is finally finished! Story and pictures can be seen here. Open at your own risk, beware of pink cuteness overload. I wore it on the Lumieres Pique Nique and ball. On the 18th century accessories I added the hat and the scarf I made for the picnic. Riding habit, my costume for the masked ball in Sveaborg, Jarno's 18th century suit. A summerdress that had lied unfinished in the closet for a year is finished now, a long rant and pictures can be found here. A tiny addition to the Smaller projects-gallery. We celebrated the eve of First of May as Winter Fairy and The King of Trolls. This time Jarno actually got to wear his fake fur vest and I made a last minute addition to my costume, a new bodice. Some new pictures here. I was happy to get new, much more clear copies of the original photographs for Kaisa's graduation dress, many thanks to Katri Tuomisto from Kuvahelmia. Yeah, and the pink Pet en l'air should be ready for Lumieres Helsinki. I hope. The projects mainpage has been re-arranged a bit with different themes. A brand new project page can be found here, a knit garment for change. I have at last successfully finished my pocket hoops, which can now be viewed at the 18th century underwear-page. Smaller Projects have a new addition too, a theme outfit for a Bachelorette for her party day. Neither sensitive persons nor those at work need not worry, it is quite politically correct and not offensive to decency, regardless all you might have heard about bachelorette parties. In celebration of the new Rammstein album and tour I made a small addition to my Rammstein outfit. And yes, it is still as stylish as it used to be, and has not transformed into a french maid costume or a tiny cowgirl-vest a'la certain music video which we shall not mention by name. You see, I always notice the costumes above everything! The new Kamelot album is also to be out soon, and tour is also about to reach our northern wilderness - we live exciting times! I still wear my old Kamelot stays of course, but Couture Mayah celebrates with epic new photoshoot. Spring is approaching fast, and I'm actually making some progress with my pretty little pink Pet en l'air. I hope to get to wear it this summer, and want a straw hat with it. From Stockholm I found a lavender blue wool cloth, which I may use for the riding habit I plan beginning some day. In Stockholm we also saw the magnificient Vasa-ship wreckage and visited a silk mill-museum, where I had a chance to admire the lovely silks and Jarno the software engineer was interested in the machinery and the first punch cards. Jarno's justaucorps is finally finished and worn in Le Bal Masqué, or Christmas ball in Viapori fortress. To be honest there is still some purely ornamental buttonholes missing, but I'm working on them by and by. Lack of pictures means that sadly I won't be able to get a project page done for a while, because for such a major project I want good pictures, preferably shot outdoors, because black material requires so much light. But at least the coat is mostly finished! On the way to the Christmas ball I also got the chance to wear my cloak, which I had already made on my vacation last winter. Due to the tight schedule and bad weather in the day of the ball I got no pictures then, but luckily the Christmas day was very beautiful, so we drove to the nearby park and got some lovely pictures. Thus the project page can now be found here. Another new project page is titled "some 18th century accessories", and has besides my old cap some new stuff too, a pair of embroidered pockets and the masks we wore at the Christmas ball. A quilted bedcover added in the Smaller projects-gallery. I'm happy to report having won the second prize on a costume competition on my workplace. More about my highly predictable costume here. While adding a few new pictures to the "smaller projects"-gallery I reorganized it a bit. The new additions can be found scattered here and there. I finally got around taking pictures of a blouse I made sometime this spring. They turned out so pretty that the blouse got a project page of it's own, though I have concentrated more on the complicated, time consuming projects lately. Tallinn was sunny and the trip nice, I only wish I could have stayed a bit longer. I found a paradise on earth on a small basement shop full of beautiful silks. I considered buying a lovely light pink silk satin for a Pet-en-l'air, but even though I might have just been able to put that sum to it I was afraid I would never have the nerve to cut it anyway. Instead I found a flamingo pink polyester taffeta, reminiscent of the Marie Antoinette movie, which shall serve well for a more relaxed experimenting, and also careless wearing. Jarno's justaucorps is still mainly in different pieces, but as I spent inordinate time making the pattern I consider that being already an achievement - especially as the pieces have most of the linen interlining attached. In a few days it's back to work again (Bleh), which will seriously reduce my productiveness again. Updates at last! 18th century weekend in Suomenlinna in June got me to finally finish my Robe l'Anglaise, Jarno's breeches and even put together a waistcoat for him. The waistcoat project page can be found here, I will tell more about the breeches on the same project page with the coat whenever I finish it. It might help to get it started first, though... I also finished a pretty little cap-type of thing, and added it to the 18th century underwear page. And I also made a project page for Jarno's linen shirt, now that I was able to shoot it with the breeches. In other words, now there is at least some excuse for the elaborate ranting about historical clothes on the "About the Seamstress"-page. My summer holiday begun today, so I may or may not get something new on the way. I am also taking a short trip to Tallinn, and it's not cheap vodka I'm after, but fabrics! I have to begin practising self control well in advance not to return with a truck load and tremendous Visa bill awaiting.